Security forces continuous their pre-emptive attacks to neutralize the LTTE in the Mannar area causing heavy damages to the enemy, defence sources in Mannar said. According to the ground troops, at least twelve LTTE cadres were killed or severely wounded in two separate confrontations erupted in the Mannar area yesterday, December 12. A bunker on the LTTE defence line at Karikkulam was destroyed when army troops launched a pre-emptive strike around 9.20 a.m yesterday. At least seven LTTE cadres were killed or severely injured due to this attack, sources added. 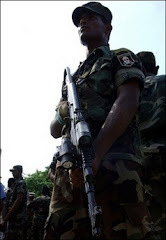 Meanwhile, five LTTE cadres were killed or severely injured when the security forces launched an attack targeting a group of LTTE infiltrators in Parappakandal area around 6.00 p.m yesterday. The LTTE group comprising five to six LTTE cadres were moving towards the security forces defences and launched an observed fire targeting them, ground troops further said.